Greetings in the Immaculate Heart of Mary. I am pleased to announce that Fr. Gobbi has assigned Fr. 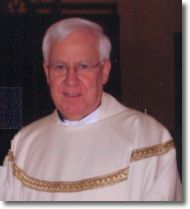 Charles Becker as co-director of the Marian Movement of Priests in the United States. The nomination was made at the international retreat which was held in Collevalenza, Italy this past June. Having been a faithful attendee at all of these retreats during the course of a decade has helped Fr. Becker deepen his understanding of the spirit of the Movement. He was also present at various U.S. clergy retreats throughout the years. It was at these retreats, both national and international, that I came to know him better and began to rely upon him as my right-hand man. “Fr. Charlie”, as he likes to be called, has a great love for the Blessed Mother and for her Movement. Our Lady has formed him well, because I have never known his answer to be anything but a resounding, “Yes.” I truly believe that Fr. Gobbi’s decision was an inspiration of Our Lady. I welcome him to this new position and ask you to pray in a special way for him and also for our staff, that we may always be attentive to Our Lady’s inspirations and desires for her Marian Movement of Priests. Fr. Becker is available to accept your invitations to conduct cenacles around the country. Since he will be traveling extensively, I ask that all requests be directed to Tammy at our National Headquarters. She can be reached during our regular office hours, 9:00 AM – 5:00 PM EST Monday-Friday (Tel. 207-398-3375) You can also email your requests to her at: mmp@mmp-usa.net. She in turn will convey the information to Fr. Becker and, once he has been notified, he will get in touch with you for further details. I have asked Fr. Becker to introduce himself (see below) and to give us a summary of the 2007 Collevalenza Retreat with Fr. Gobbi. I thank Our Blessed Mother for giving us Fr. Becker as our new co-director. May the Lord bless him with abundance of graces and may Our Lady guide him always! May his new ministry be fruitful and rewarding! Hello, my name is Fr. Charles Becker. I have been asked by Fr. Gobbi, and affirmed by Fr. Roux, to assist the effort of spreading Our Lady’s Work of the Marian Movement of Priests in the United States as co-director. Along with Fr. Albert Roux, I hope to be of assistance to this Work of Our Lady’s so to help us all be prepared during these Last Times for the expected renewal of all humanity. I meet with delight this venture and pray that I may co-operate in what Our Lady desires for us here and elsewhere in the world. A little about myself…I am a priest of the Archdiocese of Chicago, ordained August 31, 1986, and upon finishing 3-4 years in my first assignment in a Northwest Suburb I came to know the Blessed Mother in a special way accompanied by a renewed devotion to her. Simultaneously I encountered the Marian Movement of Priests in Cenacles that were established by the laity. I thank God for Our Lady’s presence in my life who helped restore my vocation when it was already in critical need even after such a short time after ordination. During the last 10 years I have attended the Retreats with Fr. Gobbi at the International Cenacle Retreats in Italy along with Fr. Roux and about 10-15 other priests from the United States and Canada. I hope to be a resource to the Movement as well as travel around the country to encourage the participants in the Cenacles in living out our Consecrations to Our Lady’s Immaculate Heart!